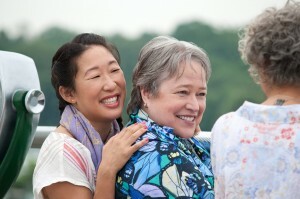 (l-r) SANDRA OH as Susanne and KATHY BATES as Pearl in TAMMY. ©Warner Bros. Entertainment. CR: Phil Caruso. 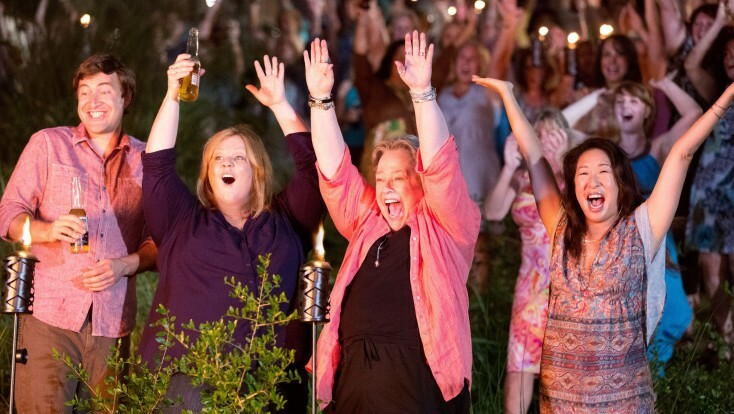 HOLLYWOOD—Kathy Bates earned an Academy Award for playing an obsessed fan in the big screen adaption of Stephen King’s “Misery.” The Memphis, Tenn., native now plays another oddball in the Melissa McCarthy comedy “Tammy,” whose obsession is blowing things up. In the Ben Falcone-directed comedy, she plays an old friend of Tammy’s grandmother (Susan Sarandon), who helps the duo hide from the law at her lakeside estate—she made a fortune in the pet store business— with her longtime lover (played by Sandra Oh). Of course, the subterfuge wouldn’t be complete without Lenore putting on an over-the-top Fourth of July pyrotechnics display for 150 lesbian friends. She also obligingly blows up the outlaws’ watercraft, an incriminating piece of evidence, to protect them. Q: As soon as you came on screen for the first time midway through the movie, everyone in the audience applauded. You can deliver a line like no one else. When you see it on the page, how do you make it funny? Bates: (in a deliberate, low-key voice) I don’t know. Part of working with Melissa and Ben, I know their comic background. I just kind of felt like they let me out of place of believing that I couldn’t be as funny as they are. So we had some improv scenes that were so much fun. Part of what I loved about working with Ben is that he just let the camera run. We had fun and we thought for a minute we could be as funny as Melissa. That was just so much fun. That happened then and it’s not happening now. So I’m realizing it was Ben, and I’ll treasure those moments. Q: Your character, Lenore, loves to “blow things up.” How was it working with the pyrotechnics? Did you enjoy it? Bates: (again, in a low voice) I loved it! I’d like to blow more things up. Q: You had to blow up a Jet Ski, but we heard that storms were threatening the night you were supposed to shoot the scene. Bates: (jokingly) The weather was me too, just to make it more difficult. Actually, what made that work for me, and I wish she was here now, was Sandra Oh, who really made our relationship work. When you’re playing a gay character, I mean, what’s that? So it was all about a relationship between two people who supported and loved each other for 20 years, and had built something out of difficult times. She, from the very beginning, said, “We should have wedding rings.” So we went to the prop guy and got them. On that particular night (of the fireworks scene), she leaned over and said, “Oh, honey, this is just like college! You did all of this in college, remember?” So, when she said that, it was like, “Yeah! Yeah! I did the javelin and I did track and I did all that stuff.” She just gave me the confidence, so it’s Sandra, really. Q: We hear you have a good throwing arm. Your character blows up Tammy’s car, which is being sought by the police. Bates: Yeah, I really loved tossing the Molotov cocktail at the car. That was really cool. I figured in that in the past, Lenore was a little wild with Susan’s character. They had probably gotten in a little trouble here and there. It was really cool. Q: How would you describe your character to someone who hasn’t seen the movie?